Don't knock it until you've tried it- this Peanut Butter Curry may just be one of my favourite recipes which I've created yet! 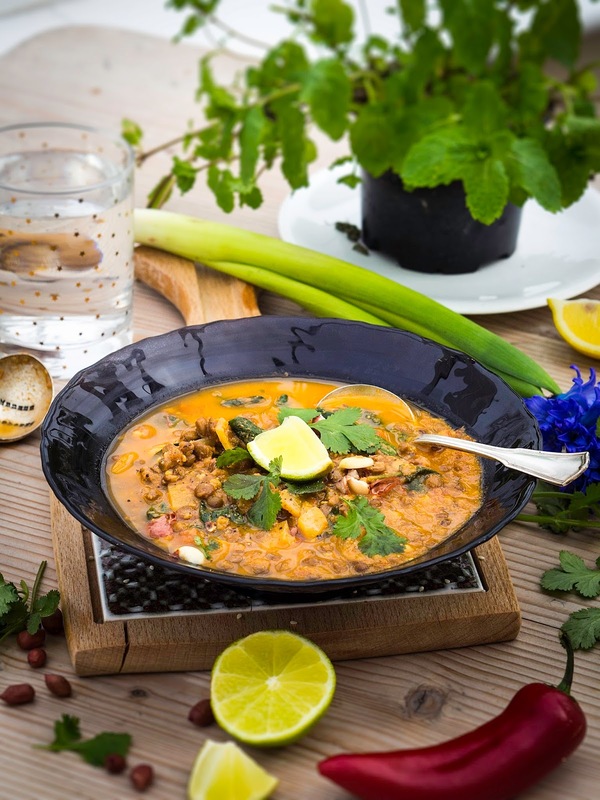 The ingredients list may look long but it largely comprises store cupboard essentials and the lentil base means that it's an affordable dish to make. Peanut butter adds a depth of flavour whilst the spices add a warming kick. I tend to make curries in advance because they always taste better once the flavours infuse and whilst this does get better over time, it also tastes great the day it's made making it the perfect choice for batch cooking and a quick meal alike. 1) In a large saucepan over a medium heat on the hob, melt the coconut oil. Add the onion and lightly fry until softened. 2) Next add the garlic and ginger and fry for a further 1-2 minutes before adding the spices (cumin, coriander, turmeric, cayenne pepper and chilli). Stir to combine. 3) Add the lentils and stir ensuring that they are evenly coated with the spice mixture. 4) Add the chopped tomatoes, followed by the vegetable stock and stir. At this point the curry will look rather watery but don't worry as it will reduce as it cooks! 5) Increase the heat and add the peanut butter, stirring to dissolve. 6) Reduce the heat and simmer for 20 minutes, stirring occasionally. 7) Finally, add the spinach and stir into the curry, heating through just until it starts to wilt.